Optimus Prime is dead!?! Well, that's basically all I got from this issue... but that's not entirely true, because he can come back somehow!?! There are no rules here. At least that I am aware of. There is no explanation why he can still be alive, I am sure they'll use some excuse such as “ his spark can reenergize him”. That's just lazy writing. While we're on the subject of writing, the dialogue doesn't flow and I got hung up so many times and found myself asking out loud “what the heck is going on”, and “I'm so freaking lost right now”. I couldn't follow this issue for the life of me. In fact, Jim gave me permission to bail... instead I'll inform anyone who enjoys reading comic books to steer clear of this one. I do have one positive point, I like the idea of the story. The momentum just wasn't executed well. Honestly I can't even give a synopsis because this book is all over the place. 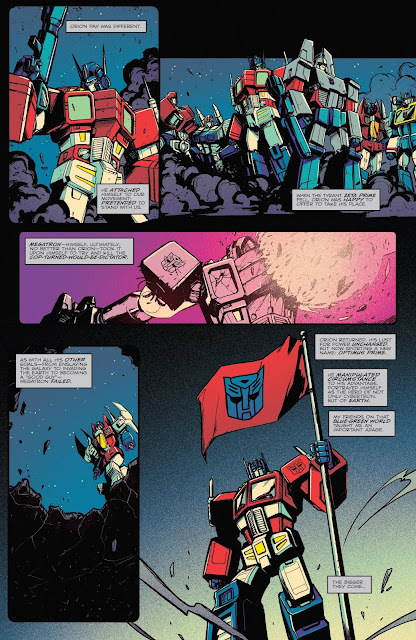 I couldn't grasp the story until the last 3 pages which depict Optimus Prime in “Limbo”... a world between life and death. This is the story I want to follow! I would like to see the trials Optimus is faced with as he makes his way back to the living. 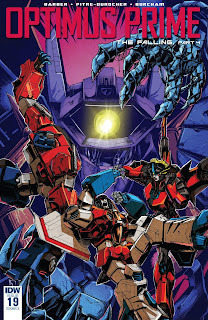 Maybe Optimus Prime #20 will give me that scenario. This issue has issues... lol... with dialogue and pacing. But, it has the potential for a great book if it can be executed in a more detailed and on point manner. This issue did nothing to get me excited except for hoping what it could become and that probably won't happen anyway.